The CARSON Virus 4.1 Brushless is the innovative 4WD buggy with a race chassis optimized for off-road skiing and a powerful brushless drive. To protect the steering servo from moisture, the housing was sealed. 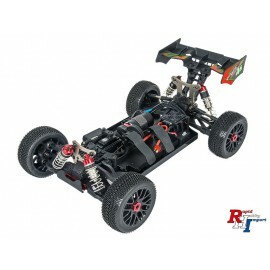 The sturdy 3 mm aluminum chassis is extra narrow and has a chassis strut front and rear. Massive wishbones and all-round dirt deflectors ensure long-lasting driving pleasure. The 2100 kV HOBBYWING brushless motor delivers massive power to the all-wheel drive and accelerates the 4.1 to over 80 km / h. Big Bore aluminum oil pressure dampers, low center of gravity and numerous setup options ensure perfect traction and let the CARSON Virus 4.1 Brushless fly over all distances.